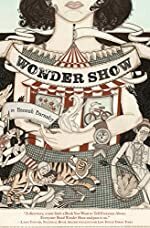 Wonder Show by Hannah Barnaby. Review: Imagine you are little and your mom is gone and your dad is leaving to find work. You are left in the care of an aunt that does not understand you. Portia's aunt is very protective, very religious and has no clue how to raise her. She knows she can't take care of her, so she sends her away to Mister's house. This is only some of what Portia has to go through in the book Wonder Show written by Hannah Barnaby. Portia misses her big family, so many aunts and uncles, and of course her dad. From the time she was very little, Portia remembers hearing stories told by her family. Her family has a gift of storytelling, and she soon finds out she had the gift as well. Portia keeps the memory of her family alive by telling stories she has made up. She also learns that the stories she tells bring both good and bad into her life. In fact, something her aunt dislikes the most is her storytelling. Portia finds herself being dropped off at Mister's house. The sight of the massive dark house reminds Portia of some huge mythical beast. She has no desire to go in, let alone live there. The house seems to be alive with wickedness. Portia meets a special friend, but she is destined to lose anyone who gets close to her. Portia hates being at Mister's house! Alone with her grief, she finds by chance a travel schedule for a circus stopping nearby. She makes her plan, and with nothing to lose, but her freedom, she sets out alone. Before long, Portia finds herself at the Wonder Show. When she arrives, Moscow, the boss of everyone at the show tells her she can work at the pie cart. Here she finally feels at home, and the circus becomes her family. However, her happiness is short-lived when she is returned to live with Mister. Will Portia ever find her true happiness? Wonder Show is an astonishing book and I believe the author did an incredible job writing it. The book had an exciting start and grabbed me from the beginning. I also enjoyed how she wrote the book in three parts: similar to a play. I also liked how the book had background information from the other characters. This was accomplished because the author wrote short chapters that were told by different people explaining their background story. I thought it was very attention-grabbing to see the different backgrounds of the characters. Therefore, I give this a rating of 5 stars. It is an amazing book to read! Review written by Hannah (6th grade student). We would like to thank Houghton Mifflin Harcourt for providing a copy of Wonder Show for this review. Have you read Wonder Show? How would you rate it?